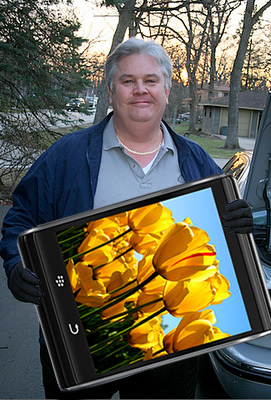 RIM Places Order with Hon Hai for 8.9-inch Displays - RIM Considering Its Own BlackBerry Tablet?! This week I received a bunch of emails, phone calls and BBMs from industry contacts seemingly out of the blue that were all to the tune of So what's this I hear about a BlackBerry Tablet?! It took a little digging to figure out where this BlackBerry Tablet stuff was coming from all of a sudden, but I got to the bottom of it. The source is from a research firm that specializes in component supply chain information - and the company sent out a brief report this week touting "RIMM to Launch Own Tablet in Late 2010" which got the industry insiders buzzing. The text in the image above that was sent in to us is from that report, which states three sources have confirmed that RIM has placed an order with supplier Hon Hai for 8.9" displays for use in a tablet. Interesting stuff. I wouldn't read too much into it at this point in time (I can't see RIM trying to go head to head with the iPad just yet), but it at least shows RIM is playing with the notion of bigger screens. What's really interesting and to the contrary is that not too long ago RIM's Founder and Co-CEO Mike Lazaridis was on Walt Mossberg's D7 and when asked about a BlackBerry Tablet Mike L. dismissed it, saying "I don't see the benefits of a tablet over a notebook... A lot of technology falls in the middle." It could be the thought on this has changed with all of the tablet buzz of late. Maybe today's announcement of RIM acquiring QNX Software is related to this report (8.9" displays for in-car touchscreen systems??) or maybe they're toying with an accessory to use with your BlackBerry (sort of like Celio's new touchscreen RedFly we showed you at MWC). Or maybe they do in fact have a team in Waterloo looking into building a full-out BlackBerry Tablet. Who knows. Could all be BS. At this point it's speculation. So what do you think? BlackBerry Tablet? Yay or Nay? Sound off in the comments!